Q. How do I chase citations through Google Scholar? Do you have an article title or citation that you need to track down? Google Scholar is an easy way to "chase citations" when you have a specific article you need to find. Google Scholar is a useful tool to use when you are looking for a specific article or book. This is sometimes referred to as "chasing citations" or "citation chasing" or "cited reference searching." We recommend starting at the EKU Libraries' homepage to access Google Scholar. Enter as much of the title of the article or book into the Google Search box. 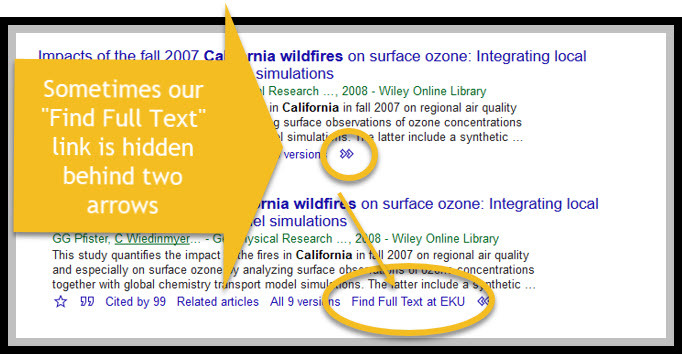 Look for the "Find Full Text at EKU" link next to the result. Use that link to get or request the full text of the article. Did you know? Sometimes our "Find Full Text at EKU" link is hidden behind the 2 arrows beneath a search result. That's the case with this article. When you click on a "Find Full Text at EKU" link, you will be taken to the EKU Central Authentication Service (CAS) screen and prompted to log in.